Do not type in all upper case unless you want the engraving to be all UPPER CASE. Use proper capitalization! Verify correct engraving information and numbers BEFORE placing your order! Orders cannot have items added after checking out. If additional items are needed, place a new order Thank you! There will be some degree of variation from plaque to plaque. 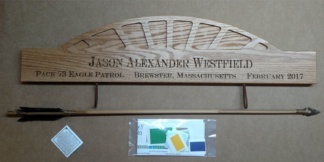 Whether it is a difference in color or knots in the wood, our plaques are as unique as the Scouts who earn them. Orders cannot be changed after placing them. Verify correct engraving information and numbers BEFORE placing your order! Please include your ceremony or need by date in the Comments Section of Checkout. Thank you!